Another great fly from the box of Ian James. This fly says "eat me." Another great pattern from Ian James, a very skilled and creative fly tyer in London, Ontario. According to James, this pattern is "based on 21 years of 'research and development'. I have incorporated five 'fish enticing triggers' into the pattern." While out with Ian fishing the Thames River near London, Ontario, I had the experience of seeing just how well the fish enticing triggers worked. This fly was hit by smallmouth bass and carp. While fishing the Saugeen River in the fall, I used this fly to successfully catch both bass and brown trout. It's one of those 'fishy' flies that you can depend upon. 1. The body is dressed well down the bend, which puts a slight curve in it. When nymphs are dislodged from their aquatic hiding places, they tend to drift 'curved.' It would be safe to assume fish see many curved snack on a daily basis. 2. The fly is 'two-tone' and the colour difference is pronounced. From experience, two tone nymphs seem to produce more strikes. 3. The thorax colour is fiery brown. Year in and year out, fiery brown is a great fish catching colour. 4. The fly has a double wingcase. 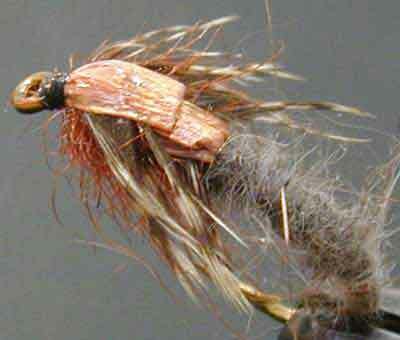 Many steelhead fishermen I tie flies for swear by the addition of a double wingcase on all their nymphs, not just stoneflies. All I can say is, if you tie the Muncher with a single wingcase, generally it will not produce as well as the double wing case version. 5. The legs are tied in 'flat' producing a smashing sliouett. Take a look at the finished fly from below. From the fishes point of view the Muncher has 'eat me' written all over it. Sizes: To suit the conditions. Range: 6 to 12, with 8 being the most popular. Legs: Well marked hen saddle. Tie the thread on well down the bend. Dub some fur onto the thread and wrap the dubbing 3/4 of the way along the shank. Pull the legs over and secure them, but do not snip off the excess feather. Pull over the raffia to form the first wing case, but do not trim away the excess. Fold the raffia 'back over itself and tie it down. Just as you tied in the first bit. Pull the feather 'up' and secure it. Pull the feather down, secure it and trim the excess. Pull over the raffia to produce the second wing case. Secure it and trim the excess. Scuff up the seal's fur. Split the raffia along its length for tying size 8 and smaller flies. The addition of clear nail polish or head cement will make the wing cases more durable. Yup. I know there is no thread base under the rabbit fur and as a result, the body might spin. I fish the fly 'tight to the bottom' and bust them off at an alarming rate. So, they never get the chance to unravel. A second productive variation is to use white rabbit for the body and use light Hungarian partridge feather for the legs. If you have them, the black and white feathers from a jungle fowl cape make stellar looking legs on both dressings. Fishing Tips: I prefer the upstream nymphing technique, with little or no manipulation of the fly. If you are fishing it across and down, let the fly hang for several seconds before you pick up to recast. As for the name? Fish love munching on it! Let me know if it works.